What flavors can you think of to pair with peppermint? When Dreyer’s Ice Cream asked me to create holiday recipes for their limited edition Peppermint Ice Cream a few years ago, at first I was a little stumped: chocolate and peppermint; vanilla and peppermint; what else? Then I wondered if spices would complement the spiciness of peppermint. A gingerbread blend of cinnamon, ginger, cloves and nutmeg happily surprised me as an immediate winner! A drizzle of white or semi-sweet chocolate is the finishing touch for flavor and decoration. If Christmas isn’t Christmas without holiday baking, the recipe below should do the trick. Or in lieu of kitchen-flour dust, use Trader Joe’s Triple Ginger Cookie Thins (3.99 pkg.) for a very tasty option. Not star-shaped, but gold star flavor! Happy Holidays! 1. Stir flour, soda, salt and spices together in a medium bowl. Set aside. 2. In large bowl beat butter and sugar with electric mixer until smooth and creamy. Beat in molasses, egg and vanilla. 3. Add flour mixture 1/2 cup at a time until dough is well blended. Shape dough into a 1-inch thick disk and wrap in plastic. Refrigerate until firm, about 2 hours or overnight. 4. Preheat oven to 350°F. Roll dough out to 1/8-inch thickness on a well- floured surface. Cut star shapes with cookie cutters. Place cookies on ungreased or parchment lined baking sheets, sprinkle with colored sugar if desired. Bake 8 minutes or just until firm to the touch but not darkened. Repeat with remaining dough, re-rolling scraps. Cool cookies on a wire rack. To make ice cream sandwiches: Remove ice cream from freezer and allow to soften slightly. Spoon enough ice cream onto a cookie to spread into a ½ to ¾ inch layer. 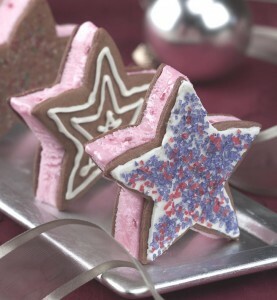 Top with another star cookie, gently press together then smooth edges with a knife. Continue making desired number of cookie sandwiches and place in freezer. For chocolate drizzle: Place baking chips in a resealable plastic bag. Microwave bag of chocolate on medium power (50%) for 1- 2 minutes until softened. Knead bag with hands until chocolate is completely melted. Snip 1/8-inch off one bottom corner of the bag. Remove cookies from freezer and squeeze chocolate decoratively onto tops. Or, spread chocolate and add sprinkles if desired. Serve immediately or re-freeze. To store longer than two hours, place in an airtight container or individually wrap in plastic. An original recipe by Rosemary Mark for Dreyer’s Grand Ice Cream. Wow! I never would have thought of peppermint and gingerbread spices together. I’ll have to give that a try. These are so cute! I love the cheater’s version, too, with the Trader Joe’s cookies. Great idea when you’re pressed for time. I’m totally into cheating with the right products!